Salmon is our favorite fish to cook when we are in the mood for seafood. My husband is from the Northwest and when I married him, he brought with him his mother’s Steamed Ginger Salmon recipe, like a dowry. I gave him Kimchi in return. I’ve had the freshest salmon from one of his neighbors who’d returned from a “Salmon Run“, the day before. It was fresh as if I caught it myself. Actually, it was better since I didn’t have to catch it. I don’t know if I could eat it if I’d caught it myself. 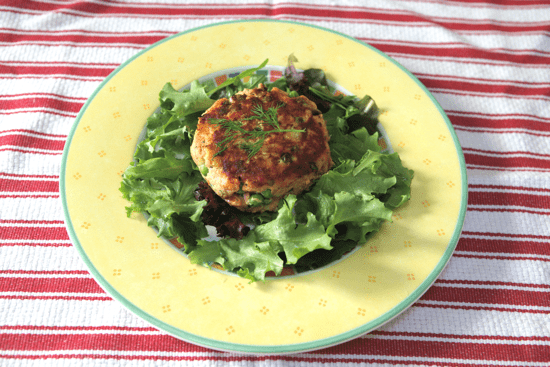 Having said, I tried various salmon recipes since my MIL’s recipe and this is the best Salmon Cake recipe I developed with the wild caught salmon. You “could” technically use any fish for this for salmon is by far the tastiest and nutritious fish there is, as far as I’m concerned. I’ve also had the good fortune of tasting the Northwest style smoked salmon straight out of a neighbor’s backyard smokehouse. Northwesterners along the Pacific coast have more smokehouses in their backyards than BBQ grills. What’s so great about salmon? Salmon is one of the most nutritious fish there is. 1/2 fillet serving size of wild coho salmon has almost 3000mg of Omega 3 Fatty Acids – a key anti-inflammatory nutrient – is low in sodium, high in Niacin, Protein, Selenium, B6, B12, and Phosphorus. And as it turns out, Pacific salmon – especially from Alaska – is one of the best sustainable and ocean safe choices for fish, according to Monterey Bay Aquarium’s Seafood Watch. Now you know why I think Frankenfish is dangerous for us and the environment and why I think wild salmon is so important in maintaining the ecological integrity of the salmon population and they should be protected from being destroyed by more aggressive genetically engineered (GE) salmon. Ok, ok…..I had to give you some background so that you will appreciate why salmon is so important to our diet and what type of salmon to buy. So, anyway, since we never eat farmed salmon, whenever we see a big sale on “Wild Caught” salmon from Alaska or from the Pacific, we buy a few pounds and freeze them. Sometimes, we don’t even get to freeze them as AR grills pounds of salmon with his “secret” marinade and they get gobbled up pretty fast. And YES, there is a HUGE taste (and nutritional) difference between FARMED and WILD salmon. But when my hubby grills or bakes too much salmon, then, it’s up to me to take care of the leftovers. 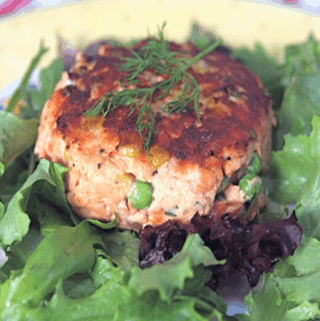 And this salmon cake recipe is the easiest way to polish up whatever cooked salmon that’s left in the fridge. Of course, you can always cook this dish from scratch and not wait for leftovers. Actually, you can use any kinds of fish for this recipe – Pacific cod, Pacific halibut, Scrod (Haddock), and even crab. They are all sustainable and will hold up well when you shape them into cakes. This recipe is how I usually make salmon cakes, with peppers and not with peas and corn, as pictured below, but I ran out of peppers and used frozen organic peas and corn instead. And they worked fine as well. Some fish cake calls for bread crumbs and lots of herbs but I don’t like to overpower the fish and I don’t want to use fillers like breadcrumbs; I want to taste the fish, not the bread crumbs or overpowering herbs. 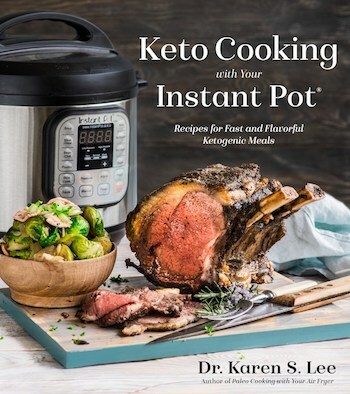 Besides, if you’re on a special diet that eliminates gluten or flour, then, this recipe is all you’ll need. Put salmon, skin side down, on a 9"x13" glass pan. Brush with oil lightly and sprinkle salt and pepper. Bake in the oven at 350 °F or grill on the outdoor BBQ grill for about 20 minutes until it's flaky but not overcooked. It's better to be slightly undercooked since you'll be finish cooking it later. When salmon is cooked, set it aside to cool and then, chill it in the refrigerator for about 20 minutes. Meanwhile, sauté peppers and onions until soft and onions translucent. Set aside and let it cool. In a large mixing bowl, mix egg or egg replacer, mayonnaise, mustard, tarragon, dill, parsley, and horseradish. Take the chilled salmon out from the fridge, crumble the fish in small chunks, and add them to the mixing bowl. Add the sautéed peppers and onions to the mixing bowl and mix well. 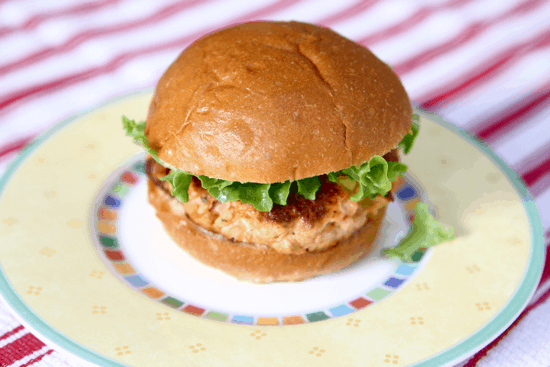 When the salmon mixture is chilled, shape them into patties, the size of hamburger patties. 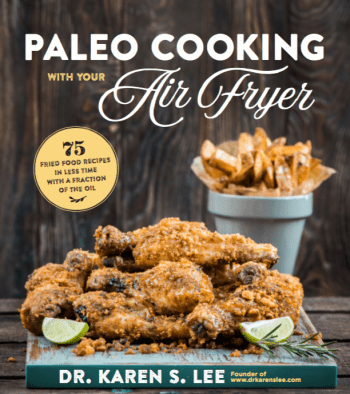 Add about 2 Tbsp of avocado in a pan and brown patties on both sides in batches - about 3 minutes each side - over Medium heat. Keep them warm in the preheated oven at 250°F until ready to be served. Either way, you don’t need any dressing or condiment as every flavor you’d want, is in the cake. You can make little patties and if you can have bread, serve them as sliders or make them bigger and serve them as entreé.